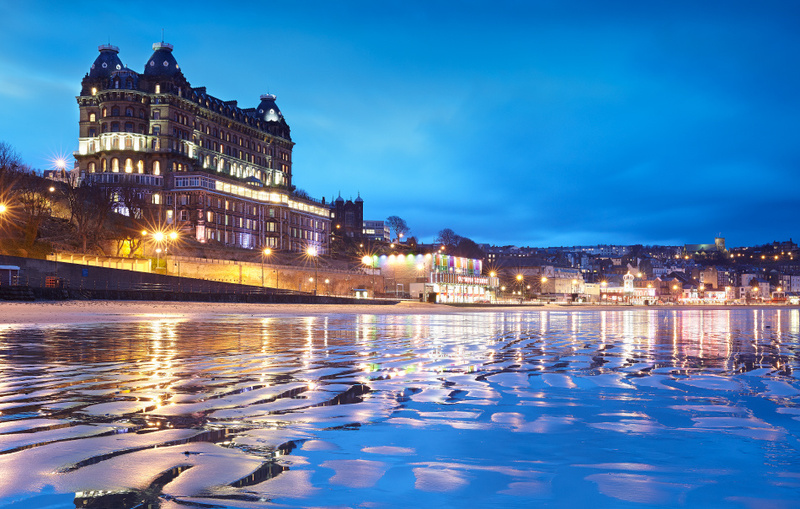 Scarborough is a large and popular seaside town on the North Yorkshire coast, but its appearance today gives little indication, at first glance, of what it was like in the mid nineteenth century. It was then a luxurious resort visited by the cream of Victorian society, and it was particularly loved by Anne Brontë. There are many indicators of Anne’s love of Scarborough: although not mentioned by name it features in both of her novels, Agnes Grey and The Tenant of Wildfell Hall. It is clearly at Scarborough castle that Weston proposes to the eponymous Agnes, and it is a sad irony that it is within the shadow of that same castle that Anne Brontë now lies buried. As the early months of 1849 trooped by in sad progression, and Anne’s tuberculosis progressed along with them, there was one place above all else that she wanted to see: Scarborough. It was a place filled with happy memories for her, and filled with the sights and sounds of nature that thrilled her so, but it had one other attraction to Anne: it was a place that people came to take the waters, in the hope of regaining health or being cured of innumerable diseases. 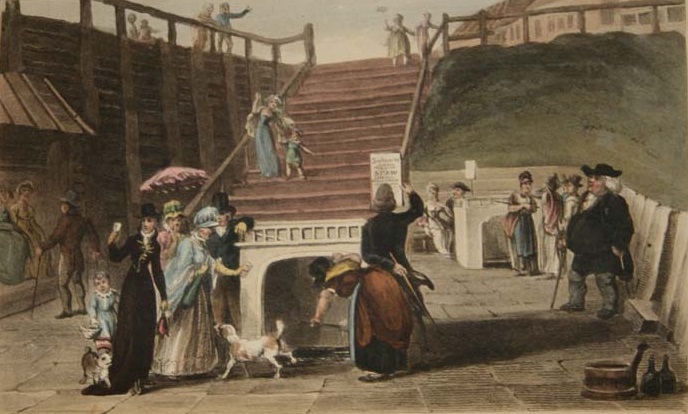 One reason that Scarborough had become so popular by the 1840s was that it was a spa town. Its history as a spa can be traced back to the late seventeenth century, when a local woman Thomasina Farrer saw bubbling water running from the bottom of a cliff. Tasting the ochre coloured water she found it bitter, but later said that she found it to have curative qualities. Word of this soon spread, and by the early 1700s the first spa house had been built. Unfortunately, the spa’s location made it difficult to reach, except via a long flight of steps, and also vulnerable to the elements. Coastal erosion was as much of a danger in the eighteenth century as it is today, and in 1737 a cliff fall took the original spa house with it. The second spa house was destroyed in similar fashion in 1839, leading to the creation of the building that Anne Brontë would have been familiar with (although that itself was replaced by a larger spa building in 1858, due to increasing popularity and demand). The railway revolution also helped to popularise Scarborough’s spa, as it made travel to the town much easier from the 1840s onwards. This boom in visitor numbers also led to the creation of the beautiful spa bridge in 1827. Still open today, it links the spa complex with St. Nicholas Cliff, the site of today’s Grand Hotel. In Anne Brontë’s day it was Wood’s Lodgings that stood adjacent to the bridge, and it was here that Anne stayed on many occasions, often with the Robinson family of Thorp Green Hall, for whom she worked as a governess, and finally in 1849 in the company of her sister Charlotte and their friend Ellen Nussey. Anne’s first visit to Scarborough occurred in June 1840 and she would visit the resort with them on an annual basis until 1845. She would spend around five weeks there on each occasion, and she found it perfectly attuned to her spirit. The sea became for Anne what the moors were to Emily, she loved to hear it crashing against the rocks and watch the gulls wheeling above it beneath a darkening sky. The spa complex was also of particular delight to Anne, as it was not only the natural mineral waters that brought people to it. The spa often hosted musical events and concerts, particularly during the summer months when fashionable folk from across the north of England arrived, and this was idyllic for the music loving Anne. As well as the spa’s concert hall, with seating for 500, orchestras also played on the elaborate gardens outside. It is little wonder then, that Anne’s thoughts as she approached her final days turned to Scarborough, but now her mind was as much on the healing waters as on the happy memories of years gone by. Anne was enough of a realist to know that there was no hope of her being cured, but she did believe that the waters may, just possibly, restore her health a little and give her more time to do the work she longed to do. After all, some people with terminal tuberculosis lived for months or even years with the condition. So it was that Anne, Charlotte and Ellen arrived in Scarborough on 25 May 1849. One of their first acts was to buy tickets that gave them unlimited use of the spa and its facilities. The next day, a Saturday, Anne insisted on visiting the spa alone, much to the consternation of her sister and friend. Now in an extremely emaciated condition she took the waters, alone with her thoughts, her hopes and fears, preparing for her death. Anne also refused assistance from the Spa and walked home alone, but collapsed outside their lodging and had to be carried indoors by their maid Miss Jefferson. It was clear now even to Anne that it was too late, healing waters or not there was nothing more that could be done for her. Even so, Anne continued to enjoy her final days in Scarborough, taking a donkey ride along the beach in a reflection of Agnes Grey’s actions towards the end of her first novel. We can follow in Anne’s footsteps today when we visit Scarborough. The Spa building may be new, but the location is that same as that sought out by Anne Brontë. 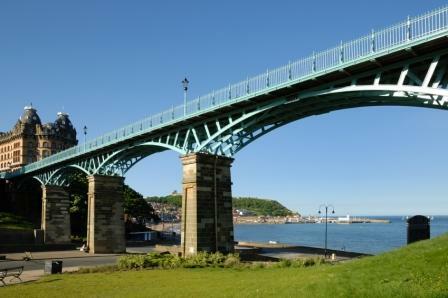 We can even stand upon the same Spa Bridge, and enjoy the thrilling sea view that Anne must have loved so much. Yes, people still travel to Scarborough today to take the waters, but if you plan on doing so please do watch out for the seagulls! Now I’ve been to Scarborough, I can appreciate it for myself. Thank you for this well-written and informative article. It’s so very important to keep historical records for the generations yet to come, and for the writers who continually draw from historical data that history loving people like you provide to us. Beautifully written! Wonderful description of Anne’s association with Scarborough. I am visiting Scarborough next weekend and this article will guide me through what I need to see there. Thank you Nick! Next Next post: Just What Did Anne Bronte Sound Like?